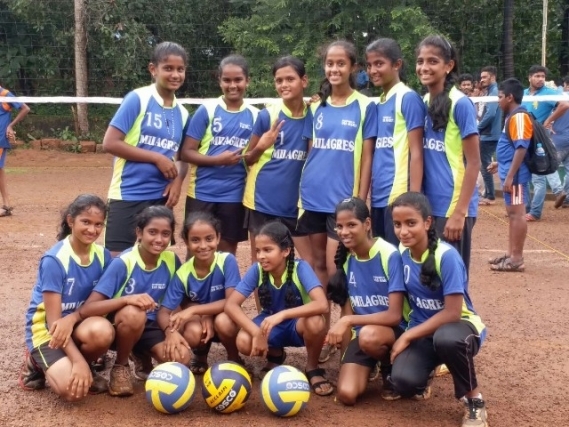 Milagres Educational Institutions is known for excellence in wholistic education along with sports and games. This year it took a step forward by inaugurating “MILAGRES SPORTS ACADEMY” near here on April 8, 2019 at the degree College grounds. The academy was inaugurated by Chief guests Rotarian Alen Lewis & Rotarian Bryan D Souza. In his speech, Rotn. ALen Lewis expressed happiness that Sports Academy was a bold step taken by Milagres Institutions for the welfare of sports in Kallianpur and Brahmavar area. He said that Milagres has given several National and State level sportspersons to the district and the state. V Rev Fr Dr Lawrence C D’ Souza, Correspondent of Milagres Educational Instituitions, backbone and inspiration for starting the Academy in his presidential address said that the long awaited dream of having an academy has come true since we have wonderful facilities for sports in the campus with a well-equipped playground. Inauguration of Summer Sports Camp began with the prayer led by students. Rev Fr Lancy Fernandes SJ, Chief co-ordinator of Summer Sports Camp welcomed the gathering on behalf of the Academy. Dr Vincent Alva gave a brief purpose of starting the Academy and the importance of conducting Summer Sports Camp as one Milagrean Family. Lighting of the lamp was held with grandeur. Heads of all MIlagrean Institutions, Dr Vincent Alva, Principal of Milagres Degree College, Rev Fr Lancy Fernandes SJ, Principal of Milagres Eng Medium School, Mr Paul Lobo, Headmaster of Milagres High School (Kannada Medium), Mrs Floreen, representative of MIlagres PU College, Mr Harold D’Silva, Headmaster of St Joseph’s Hr Pry School were present. Rotarian Vijay Mayadi, well wisher of the sports activities of the campus was also present. 70 students interested in sports belonging to over 5 institutions have enrolled for the summer camp. The Camp begins at 7.45 am and ends at 11 am. Preliminary stretch out exercises are conducted in the degree college ground. Students are expected to fill the enrolment form. Students are free to choose any two games or events to get training during the camp out of events like Badminton, Athletics, Cricket, Volleyball, Throw ball, Basketball, Handball and Table Tennis. Coaches from outside along with old students and Alumni train the participants. Physical Education Directors of Milagres Institutions namely, Mr Nikhil, Mr Steevan Pinto, Mr Vinay Shet, Mrs Cyprian, Mr Umesh, Ms Vani & Mr Harold train the participants. Mr Dolwin Dias from SMS Mr Ashwin from Suratkal come as guest trainers. Mr Vinay Shet compered the programme. Mr Steevan Pinto Proposed the vote of thanks.